Is your notebook smart? - Be your best teacher! 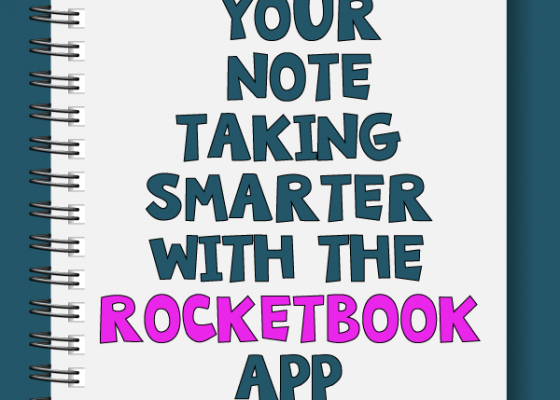 Rocketbook offers a better way to take notes and organize your teacher life! Rocketbook’s Everlast, an erasable notebook is my constant companion. It is ideal for weekly lesson planning and to do lists. It comes with one black Frixion (erasable ink) pen, but other colors are widely available. The must-use Frixion pens allow for reuse of the notebook. Erasing is easy and quick with a small amount of water. Use the free Rocketbook app to digitize your notes before erasing. The Rocketbook app makes it easy to get organized. At the bottom of each notebook page there is a set of icons. The user checks the selected designation (icon) before scanning and notes get sent to your designated place. I have the icons set up to scan to email, OneDrive, OneNote and Google Drive. Write, check the destination icon, scan one or multiple pages with your phone, send and erase! You can take all your notes in one place and get organized later. No more random pieces of paper. The Rocketbook app is also great for the classroom. The app lets you print (for free!) a variety of handouts with the icons printed at the end of page. Students can scan work directly to your digital designation for paperless grading or class presentations. I love it! Previous Post Google Classroom Freebie!